Barry and Sheryl Schwartz’ 3-year-old homebred Voodoo Song joined some pretty rarified company at Saratoga Racetrack on Woodward Day. 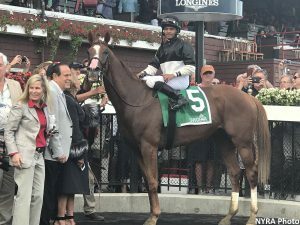 Successfully completing a front-running mission to win the $300,000 Grade 3, Saranac Stakes, the chestnut English Channel colt posted his fourth victory of the 2017 Saratoga meet, a feat not accomplished since the legendary Native Dancer won four races at the Spa as a juvenile in 1952, when the meet lasted 24 days. 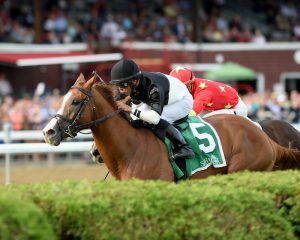 A Mike Hushion-trainee for five races before the beloved New York conditioner retired at the conclusion of this year’s Belmont’s Spring/Summer race meet, Voodoo Song broke his maiden at second asking on November 5, 2016, going one mile on the turf against state-breds at Aqueduct. In three subsequent races he was unplaced – once in the mud in the Damon Runyon on Aqueduct’s inner oval and twice sprinting on dirt in April and May at Aqueduct and Belmont, respectively. When Voodoo Song moved his tack to the barn of of Linda Rice, his new trainer made some executive decisions. She removed blinkers that had been added for the colt’s sprint starts, returned him to turf and stretched him back out to a route of ground. 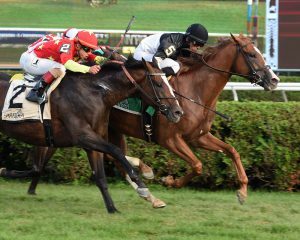 These changes, combined with a clear affinity for the upstate grass, turned Voodoo Song into a virtual Saratoga winning machine. On the second day of the meet (July 22), when dangled for $40,000 in a straight claimer, Voodoo Song wired a 10-horse field by 5 1/4 lengths, and, fortunately for Rice and Schwartz, was able to return to his home barn at the end of the day. Just four days later, Voodoo Song performed the same operation on a field of first-level state-bred allowance turf runners, winning by three-quarters of a length. Twenty-seven days later (August 23) Voodoo Song was back in the starting gate to go 1 1/16 miles again, this time to ace a second-level, state-bred allowance. But Rice wasn’t done yet. Voodoo Song was relegated to 6-1 fifth choice by the bettors, who understandably felt a little skeptical that the colt could meet the challenges of the class hike, demanding racing schedule and extra half-furlong. Their skepticism was not rewarded. Voodoo Song did bump a rival after breaking inward from post five, but then sprinted clear of the field, to lead the group by five-plus lengths through the first half-mile. A timer malfunction produced impossible splits, leaving onlookers and trainer, alike, confused about how fast Voodoo Song was actually going. In the far turn, 2-1 favorite Bricks and Mortar mounted a serious challenge, getting within a half-length of the freewheeling Voodoo Song, but the colt shook clear again. He opened up two lengths in the stretch. Yoshida made one last bid, but to no avail. 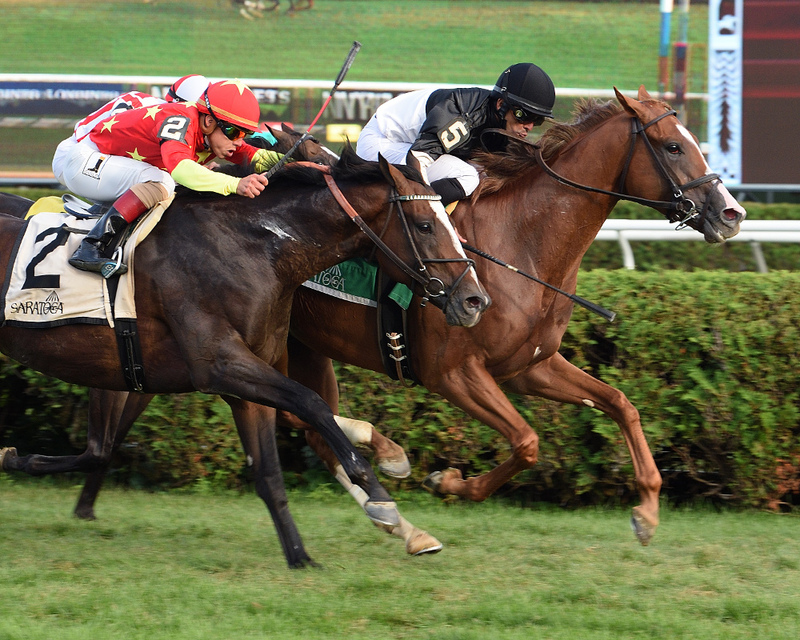 Voodoo Song held on to win by a neck. Voodoo Song is out of Stonewall Farm mare Mystic Chant, a Kentucky-bred daughter of Unbridled’s Song purchased by Barry Schwartz for $200,000 at the 2003 Keeneland September yearling sale. In an eight-race career Mystic Chant became a stakes winner for Schwartz before graduating to broodmare duties. She has produced six winners, but Voodoo Song, with a record of five wins and a second from nine starts and $360,485 in earnings, is her star. Mystic Chant’s juvenile Flatter colt Singapore Trader has raced twice, including a solid second in a New York-bred maiden special at Saratoga on August 6. The mare has a yearling full brother to Voodoo Song and a weanling colt by Japan and was bred back to Flatter this year.